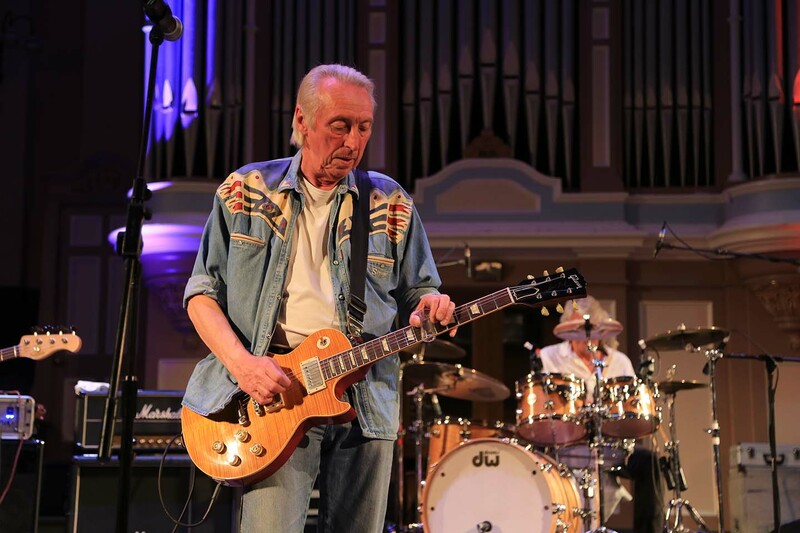 Talented guitarist Stan Webb is regarded by many as one of the great un-sung heroes of British blues music. He was born in London on February 3, 1946 and at a young age moved to Kidderminster with his parents. During the 1950’s, he started playing guitar in local skiffle bands and eventually formed his first group called ‘The Blue Four’. By this time, Webb was heavily influenced by American blues and R&B music. His next band was a line-up named ‘Sounds Of Blue’. By 1967, Chicken Shack had returned from Germany with Christine Perfect then re-joining the line-up. They played throughout the West Midlands and most often at the Seven Stars Blues Club in Stourbridge. An early fan of the band was a young Robert Plant who often hung out at the club and would sometimes persuade groups there to let him go on stage and sing a few blues songs with them. There were various drummers in the line-up during this period before Dave Bidwell from London joined them. The combination of Stan Webb’s bluesy guitar virtuoso and Christine Perfect’s emotionally charged vocal gained Chicken Shack many followers and they soon caught the attention of London producer Mike Vernon who operated his own Blue Horizon record label. Vernon signed the group to a contract and their first album entitled ‘Forty Blue Fingers Freshly Packed And Ready To Serve’ was released to critical acclaim in 1968. Chicken Shack had toured the U.K. during 1967 which included performing at the Windsor National Jazz & Blues Festival along with label-mates Fleetwood Mac whose bass guitarist John McVie struck up a friendship with Christine Perfect. The pair kept in touch after the tour and a long-distance relationship developed. In September 1968, Chicken Shack performed for the first of several times at the influential ‘Mothers’ club (formerly the Carlton Ballroom) in Birmingham. During the next year, Chicken Shack recorded a few singles and a second album entitled ‘OK Ken?‘ but it was not until the release of the Etta James cover ‘I’d Rather Go Blind‘ in May 1969 that the band had their first chart success. The record featured a lead vocal by Christine Perfect and won the group many admirers. Christine Perfect (now known as Christine McVie) went on to become a pivotal member of her husband’s group Fleetwood Mac in 1970 when she joined after the departure of their brilliant guitarist and founding member Peter Green. That band achieved massive and worldwide success during the 1970’s, particularly in the U.S.A. where they continue to maintain a huge following. Stan Webb remains a much respected guitarist whose contribution to early British blues music continues to gain recognition. He still occasionally performs today as a solo act and also sometimes with various new line-ups of Chicken Shack.